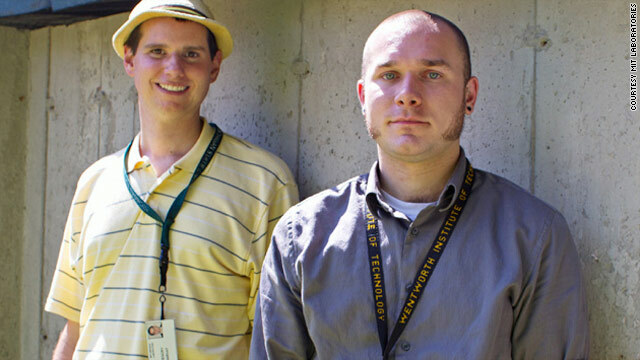 MIT researchers Gregory Charvat, left, and John Peabody have devised radar technology that can "see" through walls. Through the use of microwaves, MIT researchers have devised technology to see through walls in real time. 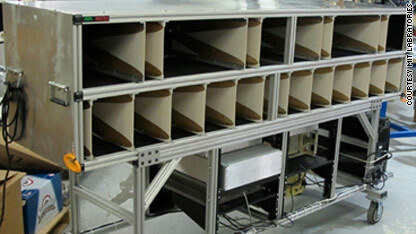 The radar array system, created by Gregory Charvat and John Peabody at the university's Lincoln Laboratory, sends microwave signals that bounce off objects and ultimately return radar images to a screen. The waves can even penetrate concrete walls. Charvat said Tuesday that the project has been in the works for a while. “It originally started out as my dissertation, where I developed a very slow prototype,” he said. “When I moved to Lincoln Lab, I teamed up with another colleague (Peabody) who was working with technology used for imaging human tissue” in medical environments such as hospitals. Almost all of the microwaves - 99.4% - bounce off the first object they encounter, like a wall, while only 0.6% make it through to the object on the other side, creating an admittedly weak signal, Charvat said. X-ray would be perfect for this application, but "it's ionizing radiation," too dangerous, he said. "We use microwave technology that’s about as powerful as a cellular phone, so it’s very weak. So, microwaves work. It’s not ideal, but it gets the job done." The system creates a real-time image at the speed of 10.8 frames a second, according to the MIT website. But the system has its limits. It can penetrate only a little more than half a foot. “Eight inches is all we’ve been able to do,” Charvat said. Visibility “may be able to be increased by more transit power or lowering the frequency. The lower you go in frequency, the better it is, but it becomes a resolution issue." But the technology could be a boon for the military, he said. "It can basically tell if there may be a threat inside of a building without having to go inside there. It’s for increasing the situational awareness of the urban war fighter." But privacy advocates say that is exactly why they are wary of it. Kade Crockford, privacy rights coordinator for the ACLU of Massachusetts, said she was "extremely concerned" about technology that could make spying easier, especially with the inevitable application of its use against an urban populace. ACLU of Massachusetts spokesman Chris Ott, in an e-mail, referenced the use of military technology being potentially co-opted for use against civilians as an increasing threat to liberty. Filed under: Technology • U.S.
@ Ruff Nutt, any more of that purple cush left? Just curious...Ok could use some right now! Send c.o.d fernace any CNN blog USA! Thanks!! I thought terahertz imaging was going to take on this role? Microwaves are a more proven technology though. One of the civilian applications for through-the-wall imaging is for fire fighting also. And probably police / SWAT activities as well. Bolster the returned image by combining it with ultrasonic frequencies (think bats and echo-location). This is NOT a new technology! Those of us (Innocent US Citizens) suffering under the Human Experimentation and Mind Control programs already experience this technology on a daily basics. Please visit http://www.multistalkervictims.org for more information. Don't be dupped! This is NOT a new technology but one that is being used to tortue their own citizens daily. Educate yourself and don't believe everything you read. You're right this isn't new technology (I don't think anyone who knows anything about SAR would be really surprised about this). However, I don't think it's being used to torture innocent citizens :). ok so u got my railgun scope working... where the rest? Pentium Cube Processor, not available to you. LMAO. The CIA has had this technology for decades. paint containing lead interfered, so they made everyone stop using leaded paint and leaded fuels. Get a vlue. If the technology seems to be new, it is old to the CIA. Example: The microprocessor that the CIA uses is the Pentium Cube. The only processor that can digitize the english language. Now, why would the CIA want our words digitized? My following post will explain why. hint: The CIA knows what you have been doing online thanks to the Pentium Cube, even if you destroy your PC. And they have their own unique ways of making you tell the truth if you haven't been online. Pls. read my next post also. However, Ron Paul wants to have the federal reserve system located inside of the USA audited by US for the first time ever. The powers that be simply cannot allow this to happen, for they would be exposed for manipulating not only our own economy, but that of the entire worlds. There are federal reserves located throughout the world, but they are simply branch banks for one single Swiss bank, the B.I.S. bank in Basel, Switzerland. Ron Paul seems to be a good and decent man who knows more about what I just said than I do. But he will go the way of our first 7 Presidents, by the wayside. George Washington was our 8th President, and a war-monger. Our first 7 were decent men who wanted nothing to do with invading and occupying foreign nations and plundering them. Too bad Ron Paul. The powers that be need a man in charge who will enforce the 'Victory Act'. The 'Patriot Act' was imposed upon US shortly after 9/11 and opened the door for the CIA to begin gathering information on all Americans involved in fraudulent activities. 9/11 was partially blamed on the lack of cooperation between the FBI and the CIA, so Congress mandated that the two agencies cooperate. The CIA has obeyed and has moved to Denver, a centralized location for their assigned task: Help the overwhelmed FBI go after Americans who have been defrauding the system and getting away with it for years. From social security/welfare/foodstamp fraud... to MD's who have been prescribing short-term use only pharmaceuticals for long terms and for profit, not health...all will be thrown into corporate prisons and forced to slave until they have paid back every single penny. Yet ! there is still time. The 'Victory Act' which allows the CIA to start sending agents to knock on your doors has only been written, not enforced. Turn around from your fraudulent activities and make arrangements with Uncle Sam to pay back what you have stolen. He will treat you with graciousness and dignity, and will arrange a very generous and kind repayment schedule to meet your budget. Mine is 40.00 dollars per month, for example. It has been 500.00 per month since 1996, but with this "economic downturn", Uncle Sam has graciously allowed me to reduce my payments. In order for you to be able to think clearly enough to do this, you must rid yourself of the influence that drugs/booze/TV/mind-dulling pharmaceuticals have had on your life. You must come clean...mind and body. Get out ! from among those who defraud our sytem. Come clean ! with America, ugly as she is. Do this BEFORE the next President of the USA signs into law the 'Victory Act' and you find yourself being WATERBOARDED, just has you have approved for use in foreign lands. The CIA has been reducing the amount of street drugs they themselves have been importing, and the first men that they are going-after are the ones pushing pharmaceuticals on US. It will become increasingly difficult for you to aquire drugs of all kinds, even marijuanna, which has been allowed for a time to help you wean yourself from the more dangerous drugs. Take advantage of Uncle Sam weaning you as a mother weans a child.